DNM1. 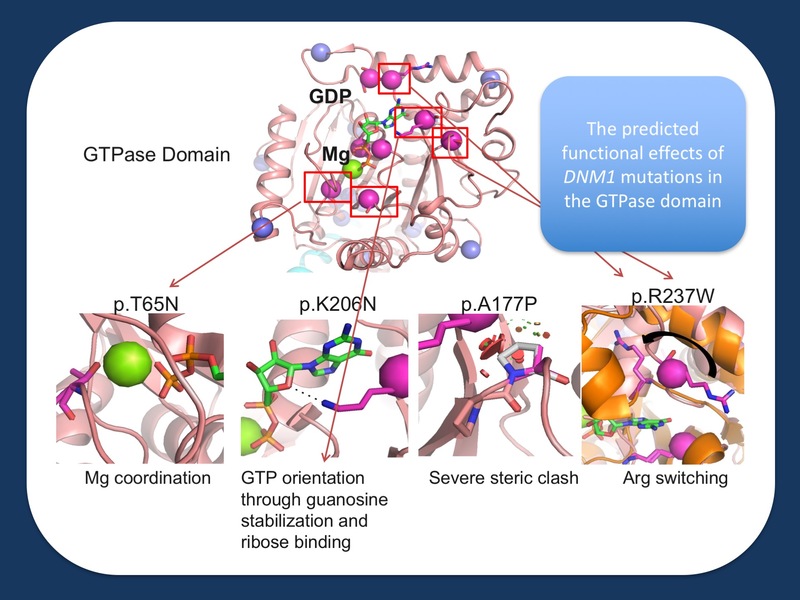 This is the Epilepsiome page of DNM1, a gene for a drug-resistant genetic epilepsy. DNM1 encephalopathy typically presents at the age of 6 months with drug-resistant Infantile Spasms that frequently evolve into Lennox-Gastaut Syndrome. The mutational spectrum of DNM1 encephalopathy is relatively restricted and up to one third of patients carry a single, recurrent mutation. A dominant-negative effect of the mutated dynamin 1 protein is the pathogenic mechanism behind DNM1 encephalopathy. While the DNM1 gene page is still under construction, we are linking the this page to our blog post on our July 2017 publication on DNM1 encephalopathy that was published in Neurology. In a nutshell. DNM1 encephalopathy is one of the rare examples where a gene was known from an epilepsy mouse model long before it was identified in humans. The mouse model, referred to as the fitful mouse is a spontaneous mouse mutant that was eventually found to have point mutation in Dnm1 in the middle domain of the DNM1 protein. DNM1 is a GTPase and plays an important role in cutting off the vesicle from the plasma membrane after the neurotransmitter had been released into the synaptic cleft. In the initial publication of the EuroEPINOMICS RES consortium and the Epi4K/EPGP consortium (the E2 working group), initially 5 patients with de novo mutations in DNM1 were identified. In the publication by von Spiczak and collaborators, 21 patients with de novo mutations in DNM1 were identified. Dynamin 1 blog post from 7/3/2017. Our recognition of DNM1 encephalopathy as a novel disease started out as a digital flicker. Deep inside some of the large-scale studies in epilepsy genetics, there were a few patients with de novo mutations in the gene coding for DNM1. However, amongst all the other likely and less likely candidates, it took a while for DNM1 to emerge as a true candidate. But even then, being a disease gene born out of large-scale studies with little information on clinical presentation and disease course, we had learned little about how patients with DNM1 encephalopathy actually present and how they develop over time. In our recent publication in Neurology, we describe the spectrum of DNM1 encephalopathy, including an unusual mutational landscape and the first genetic cause in a patient with FIRES.